Car Audio APMI Series 4 Channel Mosfet Amplifier. 3-way protection circuitry (thermal, overload, and speaker short protection). 4 ohms: 100 watts x 4 channel. 2 ohms: 130 watts x 4 channel. 4, 3 or 2 channel operation. 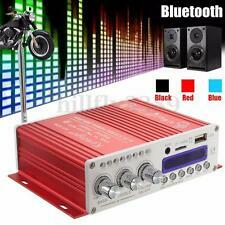 1Pc x 500W MA-150 Car Amplifier. RCA Stereo Inputs. Power Output: RMS 35W x 2CH (at 14.4V DC input). Matched with power cable and audio output cable. Frequency Response: 20Hz - 20KHz. (other accessories demo in the picture is not included.). Features:1.Can play U disk Memory /MMC card for music and FM stereo radio, support Mp3 music format. ( USB Memory card FM)2.Select high-power four channel professional power amplifier integrated circuits, minimal distortion, strong power3.Pre-professional level input operational amplifier IC for circuit design, sound , transparent,bright.4.Filtering and anti-large-capacity power circuit5.DSP sound field pattern of the four6.Tow main channel outputKey function:1.Volume: volume adjustable and host switch2.Bass: bass tuning3.Treble : Hight adjustment4.mode: play mode ,selection5.click play U disk's song6.double click played Memory card's song7.three click played Fm stereo radio8.Play/scan: the play/pause/Fm automatically adjustable.9.play modes: short p.
This PAM8610 module is a 10W, class-D stereo audio amplifier. Output power: 10W 10 W (8Ω). CMOS class D amplifier design for high efficiency and low cost. Noise canceling circuit built into the amplifier board. Product SKU: 74925 ID: ce102. Boss CE102. CHAOS EPIC Series 100 Watts 2-Channel Class AB Mini High Power Amplifier. Chaos Series 2-Channel Class A/B Car Amplifier. 6 phase alternators use less horsepower per Kilowatt than conventional 3 phase alternators. 5 Pieces Miniature 2 Channel 3 Watt PAM8403 Class D Stereo Audio Power Amplifier Module Board. This miniature PAM8403 module is a 3W, class-D stereo audio amplifier. 5x (5 pieces) PAM8403 Class D Stereo Audio Power Amplifier Module. The Lepy LP-2020A uses the Class-D Lepy LP2020 Audio Amplifier IC for low distortion, acoustically accurate reproduction of music. 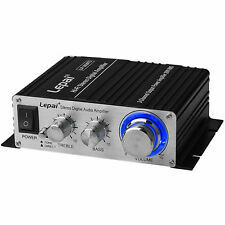 1x Lepy LP-2020A Amplifier. Tripath TA2020 amplifier chip provides efficient, powerful sound.